Samford University received a new milestone ranking among private universities in the “Best College Value” list released recently by Kiplinger’s Personal Finance. Samford was ranked #49 of the top 100 private universities in the United States. 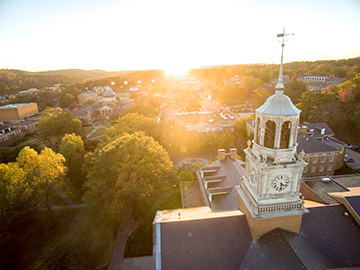 Samford is the highest ranked private university in Alabama and one of the highest ranked overall among peer institutions in the Southern Conference. The rankings were released online in December and will be featured in the February issue of the magazine. Samford also was ranked 165th among the overall Top 300 Best Values of public and private schools. This is the first year for Kiplinger’s to do a combined ranking of public and private institutions. Introduced in 1998, the Kiplinger’s rankings highlight public schools, private universities and private liberal arts colleges that combine outstanding academics with affordable cost. In addition, Kiplinger’s has ranked the top 100 best values in each category. Kiplinger’s assesses value by measurable standards of academic quality and affordability. Quality measures include the admission rate, the percentage of students who return for sophomore year, the student-faculty ratio and four-year graduation rate. Cost criteria include sticker price, financial aid and average debt at graduation. Many schools, including Samford, have appeared on the list multiple times, a testament to the consistent value these colleges provide, according to Kiplinger’s officials.